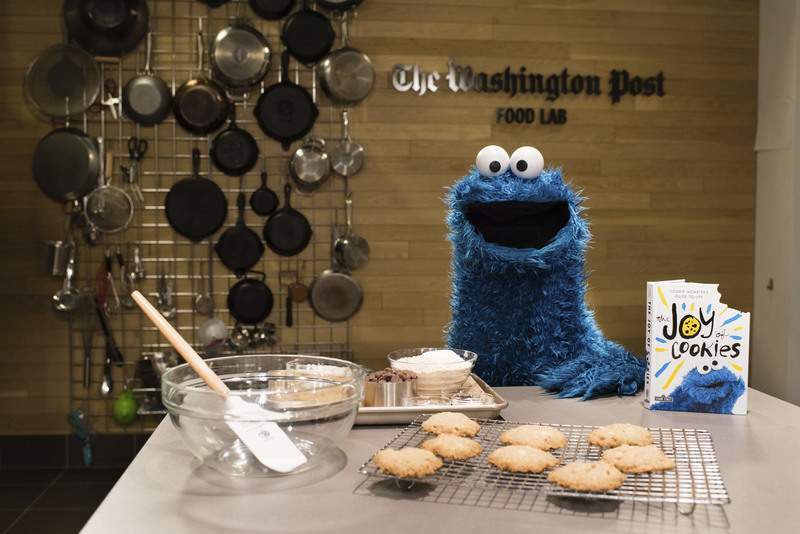 Washington Post photo by Sarah L. Voisin Cookie Monster stopped by The Washington Post Food Lab to oversee a batch of Every-Monster Cookies from his new book, "The Joy of Cookies." These featured white chocolate chips. Yes, there is a bite taken out of every book. MUST CREDIT: Washington Post photo by Sarah L. Voisin. The beloved blue Sesame Street character has a new book, you see, called “The Joy of Cookies: Cookie Monster's Guide to Life” (Sesame Street Imprint, $16). It is postcard-size, thick as a flat-iron steak and chock full of aphorisms put through the spin cycle of monster-speak. Me Eat Cookie, Therefore, Me Am. Before any serious publicity tour got underway, he paid us a visit. You'll find three recipes tucked in among the monster's Cookie Truths and Cookie Crumbs of Wisdom. Composed with varying degrees of finesse – as in, the yield is missing from two out of the three, and is that coconut oil solid or liquefied? – the guidance is just about as breezy as you'd expect. The most promising and inclusive of the lot were his Every-Monster Cookies, which are vegan, nut-free and gluten-free. We are pretty sure you might not get the recipe to work exactly as written in the book, given the batches of cookie puddles and ersatz florentines we produced in testing. But we are also thinking Cookie Monster was not intimately involved in the making – only the eating. Q. “Cookie Monster's Guide to Life” – why now? A. Well, reporter-type person, over the years Me has had many profound thoughts about cookies. Big, important, delicious thoughts. Me could not just keep them to meself forever! Q. When did you first notice cookies = happiness? A. Back when Me was cute little baby monster. One bite, and Me knew. Q. You dedicated the book to Grandma Monster. Tell us about her. A. Grandma Monster made me the monster Me is today. She taught Me everything Me know. She gave Me me very first cookie! Me use her patented cookie-eating technique to this very day. Q. Judging from your crumby writing, you are widely read and well versed in popular culture – referencing Shakespeare, Erich Segal, John F. Kennedy, “The Godfather.” When do you find the time? A. Sometimes Me is very busy monster. Me spend time with me friends, read latest books, get some exercise in, catch up on Me prestige television. But Me always make time to follow me passion: Cookies! A. Thank you for noticing. Q. ... but, in fact, you eat everything. Correct? A. Me enjoy a well-balanced diet. Cookies, meat, fish, fruit, veg-e-ta-bles, cookies ... canoe, truck, bicycle ... corners of very tasty book ... did Me say cookies? A. No comment. Me not recall. Me can neither confirm nor deny. Me fuzzy on whole matter. Definitely not mentioned on Page 22. Q. Which is better: Making cookies, smelling cookies, baking cookies or eating cookies? A. Me can't pick just one! All work together in perfect cookie harmony. Q. Tell us the story behind Every-Monster Cookies. A. The only thing better than eating cookies is sharing cookies. Me want to share cookies with all Me friends – even vegan and gluten-free monsters – so Me found perfect recipe that everyone can share. Q. Cookies in bed: Yes or no? A. Yes. Cookies everywhere! In bed, and on couch, and in kitchen, fresh out of oven, with lots of chocolate chippies . . . . What was question again? Me got distracted. A. ... Day without cookie?! Is that new sci-fi thriller or something? Me think Me will skip that one. If you use coconut oil, make sure it is solid, and preferably chilled; in testing with only coconut oil and even a blend of vegetable shortening and coconut oil, we found the cookies spread quite a bit. The dough needs to be refrigerated for at least 30 minutes, and up to 1 day in advance. The cookies can be stored in an airtight container for up to 1 week, or frozen for up to 3 months. Add the oat flour and oats, salt, baking soda and mini chocolate chips; stir until the chips are well distributed, to form a firm cookie dough. Cover and refrigerate for at least 30 minutes, and up to 1 day. Position oven racks in the top and bottom thirds of the oven; preheat to 350 degrees. Line two baking sheets with parchment paper or silicone liners. Place 9 to 12 mounded tablespoon portions of dough on each baking sheet, spacing the portions at least 2 inches apart. Bake (upper and lower racks) for about 15 minutes, rotating the sheets from top to bottom and front to back halfway through. Let the cookies sit on the baking sheets for 5 minutes before transferring them to a wire rack to cool. Repeat as needed to use all the dough. Makes 28 cookies.